Robeson Lutheran Church 3520 Plow Rd, Mohnton is sponsoring BINGO Sun. April 28, doors open at 11:15 am, start 12 pm to benefit outreach ministries and preschool at Robeson Lutheran Church. Advance tickets are $25, at the door tickets are $30. Call church 610-856-7472 or email Baylora@gmail.com. Cash prizes and Basket Raffle. Tickets include 20 regular games of bingo, hot dog and drink. Rostered Ministers will meet with Bishop Zeiser on May 2 at Allegheny Lutheran Church at 9 am. Bishop Zeiser will share "the State of the Synod". Rev. Rebecca Ehrlich from the United Lutheran Seminary will also be speaking. There will be a lunch option following the gathering. Safe and Secure Church Training: St. John's Lutheran, 4125 Penn Ae, Reading, Pa May 3, 2019 8;30 am - 4 pm A full day workshop providing practical training for churches who want to develop & improve a safety & security plan. Price $75 per person. See brochure for details. WBMD Spring Assembly - Mark your calendars for Tues, May 14th at 7 PM at Bern Lutheran Church. The Synod may ask us to do some preparation work leading up to the Synod Assembly. Please plan to send representatives to the Assembly. Plan Ahead - WBMD will offer Bear Creek Day Camp from June 24 - 28 from 9 am - 3 pm at Allegheny Lutheran Church, 1327 Plowville Rd, Mohnton. Camp is for all children who have completed grades K - 6. Cost is $35 per week, scholarships available. Registration information here. Rostered Leaders picnic July 20, save the date, sponsored by the Collegiality Team. Rostered leaders, church staff and their families will have a picnic with burgers, dogs and drinks. Please bring sides and desserts to share. Save the date. Berks Festival of Faith Free Supper meets at Bern Lutheran Church, 820 W. Leesport Rd, . Supper and service are for people with special needs/challenges and their families and friends. All are welcome. For more information contact Pr. Dave Kistler, davedeek@gmail.com or 717-933-8802. Location is 820 Leesport Church Road at Bern Lutheran Church. Trinity Lutheran Robesonia - Music Camp & Vacation Bible School - Music Camp is June 17 - 21 from 9 am - 3 pm with performance for worship on June 22 at 5 pm and June 23 at 8 and 9:30 am. Children grades 3 & up. Camp is "Malice in the Palace". Cost is $30, children must be able to attend every day of camp and performances. Vacation Bible School Jul 15 - 19 from 9 am - Noon. Theme is "Love God, Love All!" Explore who your neighbors really are! Cooking camp coming - stay tuned for details. Retired Leaders Group - Remember the first Thursday of each month the Retired Leaders group meets for breakfast at 9 am at the Heidelberg restaurant in Robesonia. All are welcome and no reservations required. Come enjoy the fellowship. JOINED IN PRAYER in 2018-2019 - As we (WBMD and member Congregations) journey through the next year, let us pray for each other on the same Sunday. Here is a listing for each Sunday and the Church being lifted up in prayer that day. 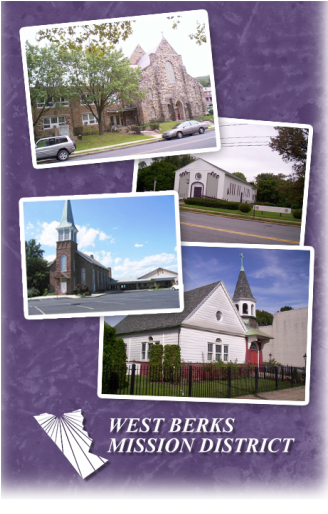 If you would like to have job openings posted here, please send the information to West Berks Mission District, 1015 Windsor St. Reading, Pa 19604 or call 610-375-8303. Allegheny Lutheran Church is looking for a Director of Youth Ministry. This is a part time position (15 hr/wk approx.). The Director will lead Confirmation, coordinate activities for youth from grade 7 - early adulthood, and actively participate in mission trip planning. Key areas of focus include discipleship, biblical teaching, outreach evangelism, coordinating and communicating with volunteers and mentoring. Compensation will be based upon experience. See the website at www.aelc.org or email resumes to the Personnel Team at office@aelc.org. Allegheny Lutheran Church is looking for an Organist, Director of Adult & Bell Choirs (Part Time) Oversee traditional music ministries in cooperation with pastor, organize adult choir, bell choir and special music as needed. Approximately 15 hrs per week. See the website at www.aelc.org for more information, Please email resumes to Personnel Team at office@aelc.org.